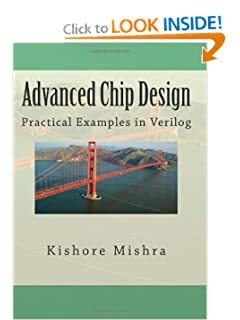 "Advanced Chip Design, Practical Examples in Verilog" brings in the concepts of logic and digital design in a simple yet effective way with plenty of real-life examples and Verilog RTL from the ASIC/SoC design world. This is a book by engineer for engineers. The book is broadly divided into two sections – chapters 1 through 10, focusing on the digital design aspects and chapters 11 through 20, focusing on the system aspects of chip design. A must book for Engineering student taking digital design and chip design courses in college and an invaluable reference for practicing chip designers. ﻿“This is a valuable addition to the rather scant practical guides available today for digital designers. What is impressive about this book is the range covered – 700 pages of insights in various aspects of digital design from basic Verilog to complex issues like DMA, arbitration, clock design including practical guide to optimizations for throughput, power, and performance. Copyright 2013 Advanced Chip Design Book. All rights reserved.